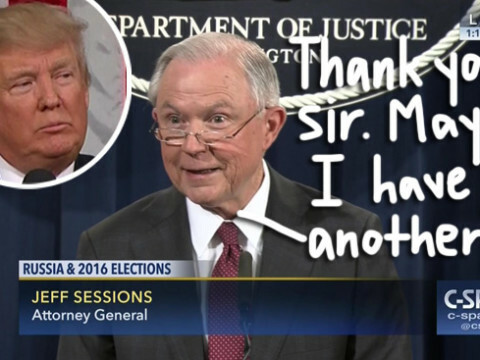 Jeff Sessions Says Trump’s Criticisms About Him Were ‘Hurtful,’ But He’ll Still Serve As Attorney General As Long As He’s Wanted! Jeff Sessions knows his days might be numbered. The Attorney General is well aware that he disappointed Donald Trump by recusing himself from the investigation into ties between Russia and the Trump campaign — and he isn’t taking the boss’s criticism lightly, tbh. Starting to sound real desperate there, Jeff. In a separate interview with the AP, the Alabama politician confessed this hasn’t been the “best week” in his relationship with POTUS, but noted he will continue to serve the president as long as he’s wanted. Trump has publicly blasted Sessions for the past week, prompting speculation that the AG would shortly go the way of Sean Spicer. Sessions went on to say he believes that he and the Big Cheeto have a “harmony of values and beliefs,” but Trump clearly thinks differently. Related: Boy Scouts Exec Apologizes After Trump Speech! We all know how the president feels about loyalty — and Sessions being more loyal to the law than Trump definitely bode well for his future with his administration! You may be a slimy, cowardly troll, Jeff — but even you can do better than Trump! Previous articleTaylor Swift & Joe Alwyn Enjoyed A Couples Retreat In Rhode Island With Ryan Reynolds & Blake Lively! Next articleYou’ll Float Too After Watching The New Terrifying IT Trailer! Trump Has NO IDEA What’s In Trumpcare! Watch The Proof!